The Ten-Series is a systematic approach to aligning your overall structure through Rolfing® Structural Integration. Frequency between sessions is generally spaced one week apart but could extend between one to four weeks apart if your schedule requires. Your initial experience with Rolfing® Structural Integration (RSI) is likely to be formatted within the three to fifteen series sessions, depending the goals involved. That being said, typically RSI is received in a Ten Series. RSI is different from most forms of bodywork because it works to improve the organization of the entire structure (often as evidence in visually improved posture), rather than focusing on a place that hurts or feels stiff. While massage is relaxing, you may find the same area bothering you shortly after you leave the office. This is often because the area that hurts is usually a secondary or compensatory issue. You may have shoulder or neck pain because you’re not getting the proper stability in your pelvis, or support from your feet, and / or because your shoulders are rounding forward (or all of these). Until proper balance returns through the entire structure, the neck is going to stay strained trying to keep your head upright. RSI focuses on the problem instead of directly on the symptom. The RSI Ten-Series is similar to an overall renewal for your body. The Ten-Series is a systematic approach to aligning your overall structure with each session building on the last and preparing the body for the next. The sessions one through three focus on the more superficial layers of connective tissue and fascia. Sessions four through seven work on the deeper layers of the body that are more closely related to the spine. The remaining sessions integrate and organize the bodies alignment as a whole with transition of movement through arms, legs and spine. This continues to help improve balance, enhanced range of motion, facilitates corrective movement patterns and resulting in a higher level of energy. The Ten-Series provides Rolfer’s® with a map, yet remains individually tailored to one’s needs. Each session has a format with structural goals similar between clients but is as unique as the person receiving it. This is because each session is based on individual needs, structure, movement patterns and learned behaviors. This session focuses on respiration and beginning to free the shoulder and pelvic girdles from the ribcage. This is accomplished by working superficial tissue around the shoulders, arms, ribcage and hips. Neck and back work is included to complete almost every session providing balance and integration of the work. Most people report feeling relaxed after this session. This session is excellent for addressing neck pain, shoulder pain, back pain, feeling less restricted in the ribcage and hips. Next we address your foundation, from the feet and lower legs, working on alignment for better support of body in gravity. Often clients feel taller and improved sense of balanced support from their feet. Clients often report better contact between their feet and the ground too. Conditions such as plantar fasciitis, fallen or high arches, foot pain, ankle sprains, knee pain, scar tissue and neuromas are addressed in this session and may include others. This session positions you on your sides and establish a lateral line of support with the goal to ease strain patterns in the front-back dimension. Work is done to manipulate the sides of your torso, neck, and hips allowing these major segments to better support each other and improving the relationship between your upper and lower body. You could imagine this as giving the body depth by opening the "seams" along your sides. Clients may find this session helpful for back, shoulder and neck pain, hip pain and tightness in the IT Band running down the outer part of the thigh. In this session work continues on the legs with focus on the inside of the leg from the ankle to the pelvis. At a slightly deeper layer, the relationship of the foot to the pelvis is aligned and torsions at the knee, hip and ankle are addressed. There is focus on addressing adductor attachments to increased range of movement of the pelvis. This starts the pelvis on its way to becoming more horizontal and balanced while in standing. The session can also be helpful for hip, knee, ankle, leg and back pain. Session Four is designed to create support of the abdominal space providing lift for the upper body. Back pain sufferers may also have a new experience of themselves with less pain. It is important to note that clients also occasionally report emotional following this session. This session disrupts physical holding patterns allowing for freedom of movement but sometimes emotional holding patterns may surface too. It’s best to schedule sessions four and five about a week apart as session five continues the work started in four, and bringing the body to greater balance. Work continues up the front of the body to provide lift up the center of your structure. Particular focus is on the abdomen, quadriceps, ribcage, diaphragm and psoas muscle. By freeing pelvic and abdominal restrictions there is better spinal movement as the base of the spine. Your frame continues it’s organization to more supportive length and height and balance throughout. In this session lengthening continues through the deep muscles of the back and hips, balancing the changes achieved from the front in Session five. Focus is on the back, base of spine, hips, up both sides of the spine and into the head. If needed the legs, calves, hamstrings are included as well. This work can be extremely beneficial for clients suffering from back pain, sciatica, and tight hamstrings. People with scoliosis and other asymmetries also find value in this session because of work in previous sessions have addressed torsions through the thighs, legs and arches in the feet that contribute to lateral curvature(s) in the spine. The work done in sessions one through six has now prepared us to organize the head and neck and relationship to the body below. This session focuses on the shoulders, neck, head and sometimes the arms too. After this session, clients often feel that their head is over their bodies and supported form below. By this time in the series, pain, flexibility, posture, body symmetry, function and athletic performance are usually noticeably improved. The final three sessions are about integrating all the work that has been done in the previous sessions. The human spine is an amazing structure that supports our posture in a vertical position, allows for rotation and connects the upper and lower segments of the body. 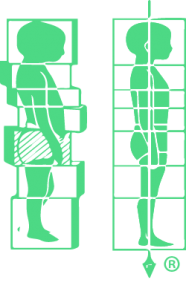 To improve these functions of the spine, work has been emphasized to free and organize vertical and horizontal support. Sessions eight and nine revisit the upper and lower segments of the body working to integrate them with the spine and with each other to work in unison as a whole transmitting kinetic energy throughout. This is the other half of session eight. For example, if we worked the lower body in the previous session, session nine will focus on integration of upper structures. The goal is always integration of the pelvic girdle and shoulder girdle in sessions eight and nine and their respective relationship to & from the spine. Session ten is typically customized to each individual’s needs and body finalizing all the goals of previous sessions. This is our opportunity to integrate and complete, at least for now, all we've been able to address through this ten series. Session ten usually involves the whole body and a return to more superficial layers. Work will be done to smooth the superficial fascial wrapping over the deeper structural layers and fully integrate the changes that you have gained. The Ten-Series is designed to leave your structure at a balanced place. Some clients will need or want to continue after the completion of the Ten Series and others will not need to. There are many clients who complete a ten-series but due to their performance levels, physical stresses or other reasons my need to continue with an Advanced Series. Other clients may only decide to complete a certain part of the Ten Series such as the superficial layers (Session1-3). There may be some clients who have specific needs or goals and require a modified Mini- Series that only addresses those. Some clients experience great results and may decide to receive another ten series after taking a break for several months or years. Other clients take a break for several months after the ten-series and then request a post ten series. Generally these continued sessions are three-five sessions long, focusing on specific goals. Others having good results and may never feel the need for another session. Some clients who go through the Ten Series will be just fine with an exercise program after. Pilates is an excellent option for them. Clients who have received the Rolfing Structural Integration series and continue with Pilates at Whole Body Kinetics & Structural Wellness have the additional option to receive a quick 10-15 minute Rolfing Corrective Manual Therapy “tune-up” prior to Pilates. Discuss your goals and options with Whole Body Kinetics & Structural Wellness to find the best direction for you. Private Pilates lessons, Pilates duet classes and Pilates home exercises are an excellent method for maintaining and enhancing the structural changes that have occurred during the Rolfing Structural Integration series.